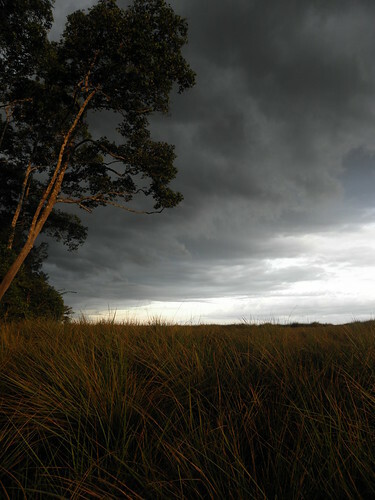 A storm moves over the savanna and the small patch of forest where Andrew and his crew have taken shelter. My journey into TL2 began in mid-September with the 6-hour motorbike ride from Kindu, capital of Maniema Province, on the Congo River. After two hours of pushing because of a broken chain and capsizing into the Kasuku river (my introduction to 2 months of never being completely dry), my motorbike and I both made it relatively unscathed to the village of Chombe Kilima. After a short rest and a lesson in GPS navigation from John, we began the 36 km trek on foot through forest, across savannas, and over rivers towards the Katopa field camp. 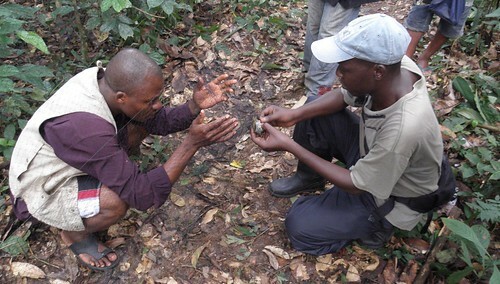 Andrew measures a bird’s wing with Ramazani poised to write down the dimensions. Over the next week, John introduced me to the Katopa crew, some of whom would be accompanying me on my excursions, and he instructed me on mist-net technique. Mist nets are a common avian surveying tool, popular because they allow close observations of a bird-in-the-hand as well as trapping more secretive and skulking species. He also informed me of my major goal over the next two months: to add to the current bird list for the park and surrounding region, currently at 212 species with a focus on the forests and savannas of the Katopa sector. In addition to the mist nets, I’d be observing with binoculars and a spotting scope (photographing individuals when possible), and recording calls with a digital recorder and parabolic microphone. Dino, a TL2 field-leader, removes a fire-crested alethe from a mist net. After learning the ropes on the birds and a couple failed attempts at reeling in a tigerfish on the Lomami River, we left Katopa down a trail into the future Lomami National Park. We stopped after about a 6-hour trek to establish a camp near Falanga savanna, one of two large savannas the trail crosses. This region of the proposed park is interesting for birding with both dense forest and savanna- island habitats—along with transition ecotone. Such a diverse range of niches makes for an impressive resident and migratory avifauna. We hoped to explore all three environments thoroughly. 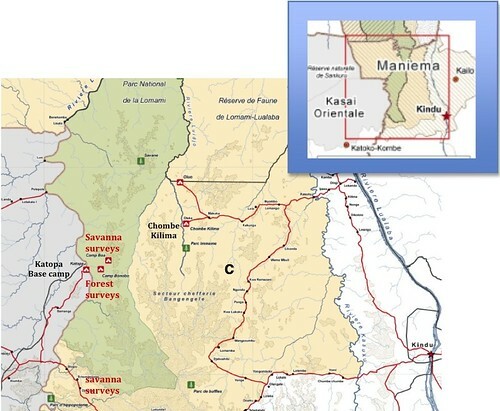 Map of the southern TL2 region and the southern part of the Lomami National Park (green) showing Andrew’s study sites. Now the sole muzungu (foreigner) and English speaker, I was accompanied by two assistants, a cook, and a few porters; it was time to start rolling. I had taken four weeks of Swahili classes during my junior-year study-abroad to Zanzibar, and in addition studied French during middle and high school. Congolese Swahili, however, is a different dialect than Zanzibari Swahili, and my French was very rusty; needless to say, communication often proved a drawn-out and exhausting affair. Nevertheless, I was able to develop a mutually-understood daily routine with my field team: We opened our 10 mist nets around 5:30 in the morning, checking them 4 or 5 times throughout the day until furling them around 6:00 in the evening. During the day, weather depending, we’d wander the area around our camp, hoping to observe and record as many species as possible. Grey ground thrush removed from the mist net; one of our big range extensions. Devout optimist that I am, I expected every aspect of my work to run smoothly. I was quickly exposed to the contrary. For example, sometimes mist nets trap birds too well, and it takes much finagling to remove them. Once, when we did not reach a netted bird soon enough, I was reminded that a struggling animal does not go unnoticed for long in the jungle: safari ants had gotten there first. Birds will also tend towards areas very inaccessible to humans; while the swampiest of grasslands and the tallest of canopies may be great places for a bird, for humans they are quite tiring on the legs and neck, respectively. One tiring aspect of the work was the constant expectation of finding something: birds don’t have a 9 to 5 workday, and all but the most extreme conditions are conducive for a particular species to be active. Some of the Cisticolas called in the hottest part of the day, owls called, briefly and always unexpectedly, at night and any number of crakes skulk around the flooded grasslands after a big rain. In addition to all the field work, I had the assumed task of learning my main field guide, Birds of Africa: South of the Sahara by Sinclair and Ryan, backwards and forwards, with occasional referrals to John’s two volume set of the Birds of West Central and Western Africa by Mackworth-Praed and Grant. A tiny yellow-footed flycatcher caught along a stream near Camp Bonobo. Poring over the accounts and maps in field guides, I narrowed down the list of species possible to find in TL2 and surroundings to around 725, of which roughly 600 I had never heard of before. Needless to say, I went through a few sets of AAA batteries in my headlamp trying to master this list. My short stints at Camp Katopa in between field sorties, in addition to finally catching a small tigerfish, did allow me the chance to recharge my batteries..
During the first circuit, which lasted two and a half weeks, I surveyed from four different camps along the trail for about 3 days each—adding a day or two for days lost to rain. Over the next month-and-a-half, I would take two more trips away from Katopa, one into the future Park, and a longer one further south into the savannas. South of Katopa, larger savannas open up; these are no longer the savanna “islands” enclosed by forest characterizing the region I had been in, but they form a corridor which connects to the wide-open stretches of grassland resembling the big game country of East Africa. JP hands equipment to Brazzos across a deep swale of the southern savannas. It was around that time that I really started dreading my bugali (a mush they make from cassava root flour that looks, and kind of tastes, like play-doh minus salt) and dried fish, which was our daily fare in the camps. But that was what we had available. I’ll never forget how happy I was to eat that first package of Glucose Biscuits one of the team leaders, Dino, brought from Kindu at the end of that last trip. Still, I appreciate going through that period of nutritional declination, mostly because then I felt like I was really living in Congo. I was there, in the thick of it, lowered down from any hierarchical social platform normally elevating visitors above their native hosts. Sure, the cook, Brazzos, always let me dish out my lunch and dinner first, but sharing that connection living in such un-pampered conditions—and (mostly) enjoying it—epitomized two months in the Congo bush for me. 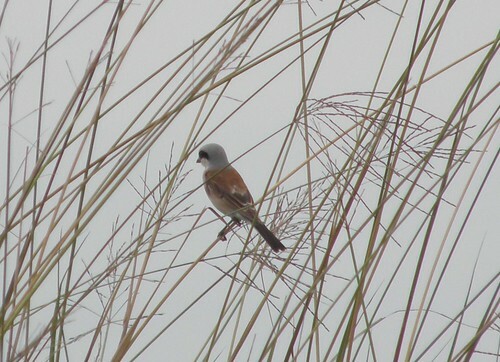 The red-backed shrike, a migratory species generally limited to large savannas; its presence suggests a closer connection to the great savannas of southern Congo than previously thought. On November 6th, the last day of my bird work, we ended up with 255 species on the TL2 list. That means we’ve boosted a list that’s been accumulating for 4 years by about 20% in 6 solid weeks of sampling. I will always think I should have been doing more, but overall it’s not a bad result. Plus, I’ll be spending a lot of December sifting through the hundreds of unclassified recordings I have, trying to identify species. Even without finishing the master list, however, we have some exciting finds: there are at least 10 significant species range extensions we’ve identified, notably Weyns’s Weaver (Ploceus weynsi) and the Grey Ground-thrush (Zoothera princei). Even the pictures I took and recordings I made of well-known species are valuable as a contribution to a growing database for the Lomami National Park. In the end, every observation in the isolated and un-sampled TL2 region is a valuable record. 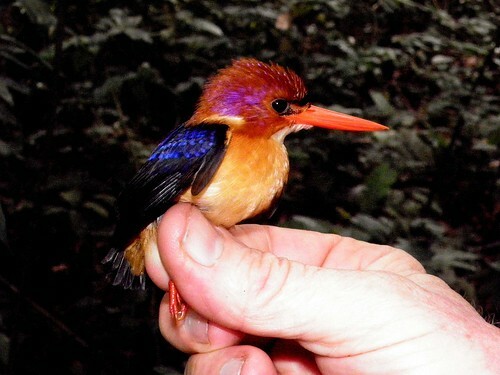 This African dwarf-kingfisher was one of six species of kingfisher caught by Andrew and his team in the mist nets during their 6 weeks of observation. The Central Congo is a fascinating place if you are interesting in anything natural and unspoiled: the flora, the fauna, the people, the paradigm. These do come in conflict: people will sometimes cut too many trees or hunt too many animals, but in the TL2 at least, everything interacts with a temperament less biased by consumerism, and more slated towards self-subsistence. Here, it seems, is a place “progress” forgot, where the circular and communal goal one day is often just to be able to begin the following day. It may not sound like an ideal relaxing vacation get-away…. Congo is just different: getting around is a nightmare, corrupt officials expecting bribes are left and right, and I never felt very secure when I was by myself. But when you finally get to TL2, and see how the TL2 project has integrated with the land and people, you cannot help but leave with aspirations of returning and continuing to make the country more aware of everything it has worth protecting, and helping the people protect it. And I want to catch a bigger tigerfish. We have identified some species in TL2 that, according to distributions found in the seven-volume The Birds of Africa would be noteworthy range extensions. I mention the specific text, as there is considerable variation in ranges among other sources. Whether I note a range extension as major or minor is rather subjective, but I take into account the extent of their documented distribution as well as its proximity to the TL2 region; for example, Weyns’s Weaver is documented to live in north Congo, but since its distribution was pretty restricted I call that a major range extension. I also note if the species is migratory. Agelastes niger (Black Guineafowl): captured by Julian Kerbis of the Chicago Field Museum. 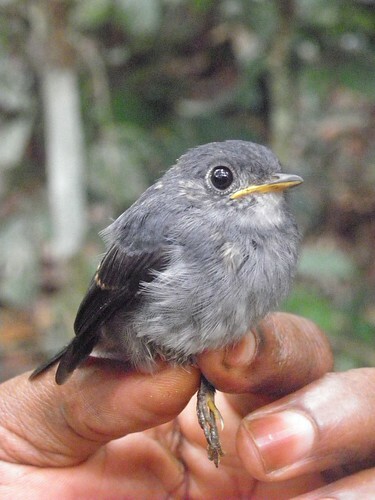 This bird has never previously been recorded from Congo’s Central Basin. Larus fuscus (Lesser Black-backed Gull): Palearctic migrant. Seen at the Kindu airport on the Congo River. Chroicocephalus ridibundus (Black-headed Gull): Palearctic migrant seen near Kindu on the Congo River. Bycanistes subcylindiricus (Black-and-white-casqued Hornbill) Uncommon in the savanna ecotone. First seen was a bird killed by a local hunter, but then later living birds. Ploceus weynsi (Weyns’s Weaver). Seen in a forest gallery on savanna. Parmoptila jamesoni (Jameson’s Antpecker) Caught in mist net in forest . Hieraaetus ayersii (Ayer’s Hawk-eagle) Good view of a pair over forest-savanna ecotone. Afroapvo congensis. (Congo Peafowl) Uncommon but widespread in forest; nocturnal crowing call recorded. Aplopelia larvata (Lemon Dove) Uncommon but widespread in forest. Raphidura sabini (Sabine’s Spinetail). Common over forest and ecotone. Merops breweri (Black-headed Bee-eater): intra-African migrant Most frequently seen in September-October. Resident population likely as well. Pterodelichon rufigula (Red-throated Cliff Swallow) Migratory flocks savannas, september-october. Apalis goslingi (Gosling’s Apalis) Regular in small flocks along the Lomami in riverine forest. Anthreptes aurantium. (Violet-tailed Sunbird) . 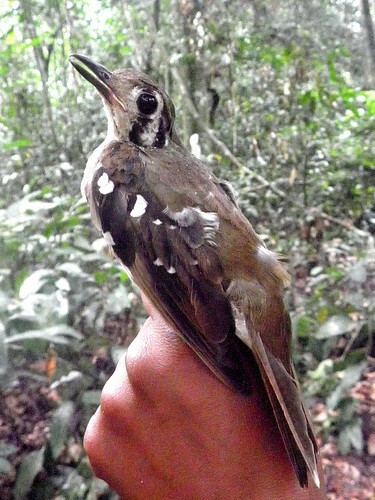 Common in riverine forest along the Lomami. Nesting pair at Katopa camp. There are also many generally uncommon residents and migrants that occur in the TL2, for example Pitta reichenowi (the Green-breasted Pitta), Vanellus lugubris (the Senegal Lapwing), and Accipiter toussenelii (the Red-chested Goshawk). 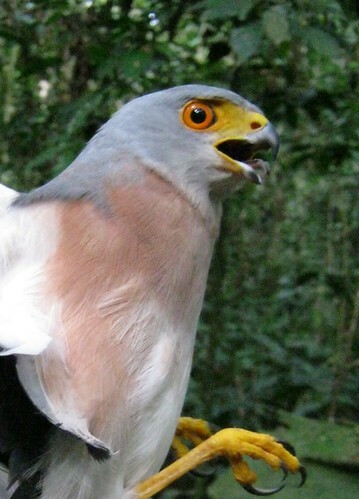 This red-chested goshawk had a larger patch of bare yellow skin than recorded in the bird guides. Some of our photos reveal field characters that have not been highlighted in the field guides. For example, A. toussenelii, we noted, had a major patch of bare yellow skin on the face. The field guides just mention the yellow cere. We will post our full list to date shortly after we finish our review of the bird recordings. This entry was written by Terese Hart, posted on 2011-12-04 at 7:08 pm, filed under About the project, Natural History of TL2. Bookmark the permalink. Follow any comments here with the RSS feed for this post. Post a comment or leave a trackback: Trackback URL. Thanks for this fascinating post. You do a great job of describing your work and the photos are lovely. It’s a beautiful shrike and I love the savanna photos (I’m a prairie gal). Congrats on the range extensions. Thanks Cindy, I’m glad you enjoyed it. I could give you some more savanna photos if you’d like, just send me an email. Andrew what beautiful photos! Thank you. Hi, I’m just curious about Afropavo Congensis. What evidence besides night-time crowing did you find? Apparently, its sparse throughout its entire range – probably due to hunting enabled by its night-time crowing. Given previous reports of green pigeons being hunted in TL2, I’m just wondered if there is any knowledge of hunting? What do hunters know of the bird? Our first confirmation of the Congo Peafowl in the TL2 was (sadly) feathers from an adult male we found at a hunters camp. So the birds are clearly at risk, and we are especially concerned if they are targeted by such techniques as snares in drift fences. We hear the birds nocturnal crowing uncommonly. The peafowl seems to be less common in TL2 than in Salonga or Lomako, further west. But it is more common in the TL2 than in the Maiko National Park. It really seems to be most frequent in Congo’s central cuvette. 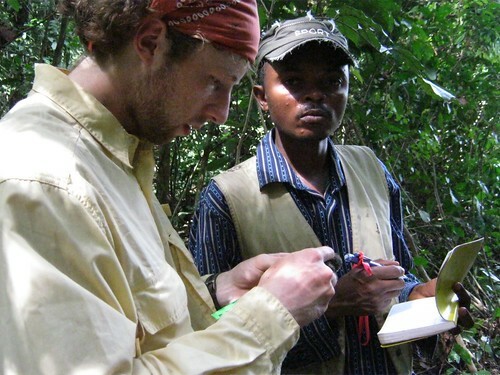 Have you had any confirmation of the species in the Ituri? Some of the Bambuti (Tambo) knew the bird from its illustrations. It is so distinctive, so there is a real possibility of its occurrence in the Okapi Reserve. Thanks for your response. I recently read your survey report from 1996, and saw that Ituri was possible but unconfirmed. I’ll look into it, see what Tambo has to say. What part of Ituri would be possible habitat? SW? Interesting that Congo peafowl is more common in Cuvette Centrale than in the east (especially Maiko). As a sometime researcher and long-time mistnetter I was very concerned to read that you only checked your nets a few times each day. I was trained by some of the best ornithologists in South Africa, and our normal protocol was a net-check every 20 to 30 minutes. Birds left longer than that run increased risk of dying from heat-stress, predators, etc. — I was not at all surprised to read that you had birds attacked by ants etc. All banders, in my opinion, have an obligation to treat the birds in their nets as best they possibly can. If banding is done carefully, mortalities and injuries can approach zero. Stories such as the one you have told above only increase the antipathy towards ornithology from birders who see ornithologists as uncaring individuals only in search of a few more data points. If you are catching too many birds to be able to check nets and process the average catch every 30 minutes, you should be taking nets down or adding more staff, according to the rule-of-thumb protocol I was taught. I would strongly suggest that you reconsider your fieldwork protocols and get some further training from ethical, experienced banders. Thank you for your comments. I share your concerns about the need for high standards for these surveys, and to keep the risk of death or injury to birds as low as possible. We closed nets when rain or other bad weather threatened and we checked furled nests after dark to be sure nothing was caught by accident. In a typical netting day, covering 10-12 hours, we passed each of the nets 13 to 15 times (30-45 minutes between visiting each net). The incident I referred to with the safari ants was, thankfully, isolated. We had no indication that ants were in the area. The bird that was attacked likely spent less than half an hour in the net before being found by the ants. We closed this net after this incident until the ants had cleared. I’d be interested to learn more about your work, the species and environments you work in. How did you come across my report?